the International Orton Cone Box Show. It has recently been published in several books including The Ceramic Design Book, Best of Pottery 2, and The Art of Contemporary American Pottery. She has taught numerous workshops on Majolica. In my work, it is my intention to create pots that enter people’s everyday lives in a direct and intimate way. My goal is to integrate form, function and surface in a manner that brings a sense of excitement to my work. I am continually exploring the relationship between surface decoration and form, while in the surface treatment of my work; I strive for lively expression of line, pattern and color. The floral motifs on my pots are patterns rather than actual representations that serve to divide the space in interesting ways. My hope is that the pots invite use and that my pleasure in making them is shared by those who use them. The pots combine thrown, altered and hand-built sections. These sections are made separately and then assembled. I enjoy altering the thrown forms and working in this manner. The pots are majolica on terracotta. 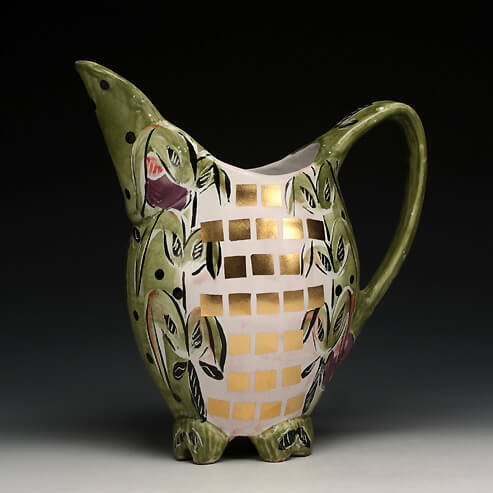 Majolica is a glaze tradition that began in the Middle East in the 9th century with a tin-opacified glaze. Majolica glaze is smooth, white and opaque. Colorants are applied in a thin wash to the glazed surface to create the lively decoration. The pots are fired to cone 04 in an electric kiln. After the firing the glaze gives a glossy surface that maintains the line quality and color of the decoration.